Guests plug in for no extra charge. 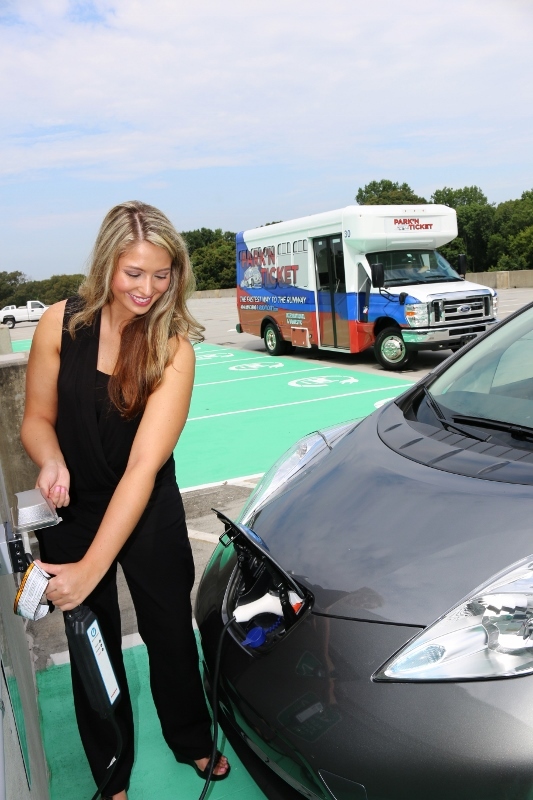 ATLANTA - Aug. 26, 2015 - PRLog -- Park’N Ticket Airport Parking is announcing 10 additional electric vehicle charging spaces at their offsite parking facility servicing the Atlanta Airport, bringing the total to 27 for this hybrid friendly lot. EV owners can enjoy this convenient service at no extra charge. These newly added spots are in open air section located on the lot’s top deck and are dedicated for EV parking only. The lot first announced electric vehicle parking one year ago, and now offers 20 open air EV spaces on their top deck and 7 EV spaces in their covered deck. The covered spaces are open to any vehicle, so customers can also call ahead to reserve these highly sought spaces or request their car be valeted to them once they become available. All of the charging spaces feature 110v plug in ports for a trickle charge, perfect for their traveling guests. This type of plug should fully charge within 20 hours, or less in some cases. Wag Atlanta, Party in the Park!